Why do you need to write the perfect legal resume? It's not just hard to get a job as a lawyer. There are 1.3 million of you battling for 790,000 jobs. Law schools dump another 45,000 a year on the market. Is it any wonder your attorney resume must stand out like a brief by Latham & Watkins? It's the only way to get interviews with prestigious law firms and plush corporate companies. The good news? Writing a great law resume is 10x easier than law school. A lawyer resume example better than 9 out of 10 other resumes. How to write a legal resume that lands more interviews. Tips and examples of how to put skills and achievements on an attorney resume. How to describe your experience on a resume for a lawyer to get any job you want. 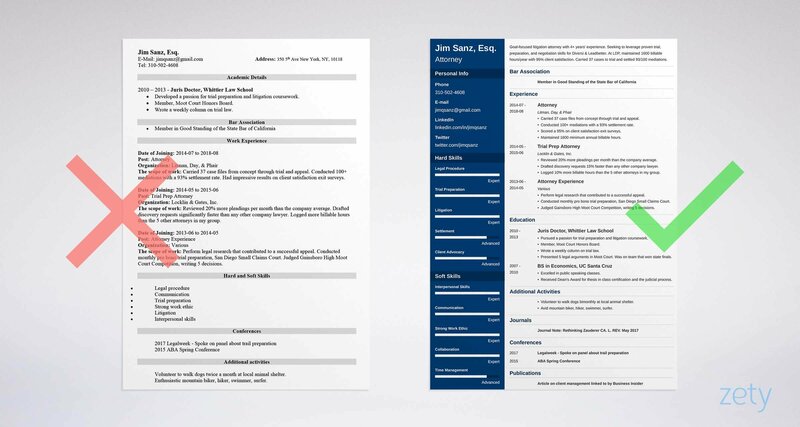 Here's a legal resume template made with our online resume builder tool. What's the Best Format for an Attorney Resume? Meet the hiring manager at that superstar firm. Her name's Katie and she craves attention to detail. Is it any wonder your lawyer resume must embody that? Impress her with the best legal resume format. The chronological resume format makes your case block by block. It starts with your most recent wins. 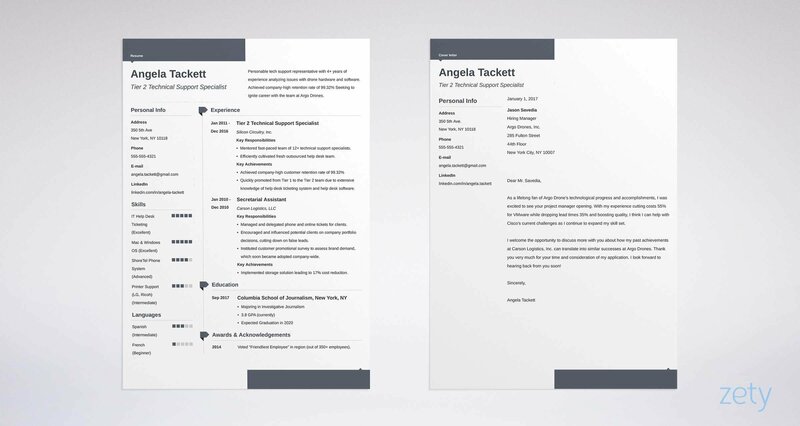 Leverage white space, the best resume fonts, and clear headings. Let nothing stand between you and the interview. Not sure whether to send your resume in PDF or Word form? PDFs are now machine readable. Use a PDF unless the job offer outlaws it. Pro Tip: Are you writing an entry-level attorney resume? The chronological resume format is still your best bet. If you're a career-changer, consider the combination resume format. It lets you focus on transferable experience. Law Resume Summary or Resume Objective? A brief's opening paragraph should tell the judge what the case is about. Likewise, the opening paragraph of a resume for a lawyer should summarize your resume. If you've got more experience than Horace Rumpole, use a resume summary. It shows your best legal achievements that fit the job. Fresh out of law school? Use a resume objective. It shows you're a great pick based on passion and enthusiasm. Though as you'll see, that's not enough by itself. The two legal resume examples below present the evidence. Which of these lawyer resume examples looks more appealing? Enthusiastic general counsel attorney seeking high-paying position. Very skilled in corporate law and trademark law. Extremely hard worker and not afraid to work long hours. That's not actionable, but it won't land a ton of interviews. 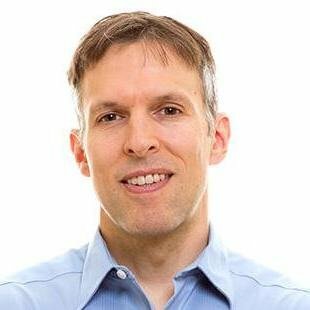 Goal-focused litigation attorney with 4+ years' experience. Seeking to leverage proven trial, preparation, and negotiation skills for Diversi & Leadbetter. At LDP, maintained 1600 billable hours/year with 95% client satisfaction. Carried 37 cases to trial and settled 93/100 mediations. That lawyer resume summary could get you in at Ropes & Gray. Is your experience more like a blank pleading template? See the law student resume examples below. Still an entry-level attorney with no experience? Junior attorney seeking entry-level position. Haven't yet held a full time lawyer job yet but I've been working very hard at retail and bartending to make ends meet. Can you handle the truth? These days, that kind of legal resume objective will get thrown out for lack of evidence. Hard-working attorney seeking to maintain a high rate of annual billable hours for Locklin & Gates, Inc. Have judged 5 High School Moot Court Competitions. Have performed 15 contract reviews for local artists. Conduct monthly pro bono trial preparations for small claims court. But how did a recent graduate get that kind of experience for a law student resume? Pro Tip: Don't write your lawyer resume summary first. Write the rest of your attorney resume first, so you'll have plenty of precedent to draw on. Let's peek in on our hiring manager, Katie. Experience matters a lot to her. But she doesn't just want to know you've had a legal job. She wants to see you've had the best law jobs that fit the job she's offering. So, lock your experience to the job description like an ironclad contract. First, highlight the qualities in the job description. Then, search your past for admissible proof. The legal resume examples below show how. Carried 37 case files from concept through trial and sometimes appeal. Conducted 100+ mediations with a 93% settlement rate. Scored a 95% on client satisfaction exit surveys. Maintained 1600 minimum annual billable hours. That makes your case like Johnny Cochran. It's got measurable achievements that match the job description perfectly. Trial lawyer for busy firm with a large roster of high-end clients. Responsible for conducting client mediations and settlements. Conducted all aspects of trial work, including preparation, depositions, and delegating lesser staff to office staff. It's clear you have experience. But were more like Atticus Finch or Saul Goodman? In other words, what effect did you have? The best legal resumes include metrics and numbers. Writing an attorney resume with no legal experience? In that case, see the two law school resume examples below. According to the New York Times, 40% of law students are still unemployed ten months after graduation. Watch that at work in two entry-level legal resume examples. Attorney Experience: None yet in the real world. Performed legal research that contributed to a successful appeal. Conducted monthly pro bono trial preparation, San Diego Small Claims Court. Judged Gainsboro High Moot Court Competition, writing 5 decisions. Elle Woods couldn't have said it better. Yet you may already have the material for a law student resume like that. Pro Tip: Add metrics to the bullet points in your lawyer resume. Billable hours, client satisfaction scores, and number of clients seen all make great measures. You know a legal resume must show a solid education. But did you know there are two ways to do it, and only one will get the interview? But add 3-5 bullet points. Stipulate them with academic achievements that get the interview like it was ordered in a mandamus. The attorney resume examples below provide a clue. Pursued a passion for trial preparation and litigation coursework. Member, Moot Court Honors Board. Wrote a weekly column on trial law. Presented 5 legal arguments in Moot Court. Was on team that won state finals. The verdict? That's a lawyer who was prepping for this job back in school. That lawyer resume example absconds with your employment hopes. But add details, and you're in the Erin Brockovich zone. PS – Add your bachelor's degree to your law school graduate resume too. See our attorney resume template up top for placement. Pro Tip: Don't list your law degree as a "Juris Doctorate" on a professional legal resume. The correct format is "Juris Doctor" or "Doctor of Jurisprudence." Convince the hiring manager of your legal skills, and you'll get the interview. Of course if it were easy, everyone would do it. But there's a simple change you can make to your lawyer resume to pull it off. The attorney resume examples below are exhibits A and B. They're for a job opening that seeks skills in reviewing pleadings, drafting discovery requests, and time management. What's the problem? It just lists everything. Which is the same as listing nothing. So, select the skills shown in the job description. Then, like Joe Pesci in My Cousin Vinny, show hard evidence you've got them. That's what the next of our attorney resume examples does. Reviewed 20% more pleadings per month than the company average. Drafted discovery requests 15% faster than any other company lawyer. Logged 10% more billable hours than the 5 other attorneys in my group. That's not just a lawyer resume skills list. It's a ticket to an interview with BuckleySandler. This legal resume skills list brims with great law resume keywords. Find more in legal job descriptions online. Use the plan above to write a legal resume that gets the interview with no deliberation. Pro Tip: How long should a resume be for a lawyer? Learn when to use a two page in-house counsel resume and when one page works best. "How do I put my bar admissions on my resume?" The hiring manager won't always look carefully for your bar status. If it's not prominently featured on your lawyer resume, she may move on. Put "Esq." after your name. Member in good standing of the XYZ State Bar. That advice goes just as well on a lateral attorney resume as on a corporate attorney resume. Pro Tip: Should you add other association memberships to a legal resume? If they don't pertain to your law career, leave them off. They will dilute your message. Remember Katie, our hiring manager? Who would she rather hire? Someone going through the motions? Or a lawyer who breathes, sleeps, and eats legal work? In a resume for lawyers, that means using special "other" sections. The lawyer resume examples below show how. Remember, we want to show your passion for law. Volunteer to walk dogs bimonthly at local animal shelter. Avid mountain biker, hiker, swimmer, surfer. That's no mere lawyer resume. It's Paul Hastings in the rough. But it only takes a little head-scratching to turn up enough material for a legal resume like that. Pro Tip: Don't put unpublished journal notes on your new attorney resume. A note will only impress the hiring manager if it found a home. How About a Cover Letter for an Attorney? Do you even need a cover letter for a lawyer resume? You bet your bar association membership you do. The sad truth is, most hiring managers spend just six short seconds on each resume. Your attorney cover letter can turn that to ten minutes. How? So, use the hiring manager's name. Then, show you understand the position. Last, prove how you can fill it. Close your cover letter with an offer. "I'd welcome the chance to show you how I maintained an average 1600 billable hours a year at LDP," works great. Pro Tip: Don't make your lawyer cover letter a rehash of your attorney resume in prose form. Just list one or two impressive achievements as evidence that you can do the job. What contact info belongs on a legal resume? What should you leave off? But also add a LinkedIn profile. In 2018, 87% of hiring managers use LinkedIn during their employee search. You can leave off your snail mail address, though showing you're in the same city as the law firm is a plus. Tailor your attorney resume to each job you apply to. Do that by reading the job offer carefully. Pay special attention to the skills and responsibilities in it. Write your bullet points to match those qualities. That will fit your lawyer resume to the job opening like a custom crafted contract. Add other sections to a resume for an attorney to show passion and engagement. Those can include journal work and volunteer work. Do you have questions on how to write a great resume for an attorney? Not sure how to describe your skills or achievements? Give us a shout in the comments! We'd be happy to reply! A complete guide to writing a professional resume for a paralegal position. Use our sample of a resume for paralegals. Read more!